Strangers talk to each other and meet for a ’decent talk’ instead of talking about each other. The topic is known in advance and is of interest to all. Everyone gets inspiration, fresh energy and connections?! We want to organise such talks! PaperSurfing has emerged from these thoughts. Theoretically, this is easy to answer: A good conversation needs people who are interested in each other, people who are interested in the topic and it requires a suitable ‘how’. In practice, part of this ‘how’ is a moderation, for example to make sure no one is interrupted when speaking. Bringing a moderator to every conversation with 6 people seemed impractical to us. We have therefore developed something else: Simple ‘rules of the game’ and a timer app. Together they act as ‘good moderators’. We’ve tried this format several times now and it works well. Everyone gets a word in and is heard by everyone. Strangers can get to know each other there. Paper – everyone brings a text on the given topic which is important to them. Surfing – Each text is discussed for a while in the group until the wave fades out. It all started in 2016, when we were at the taz.lab in front of the House of World Cultures in Berlin with the participatory project LISTENING PROJECT. 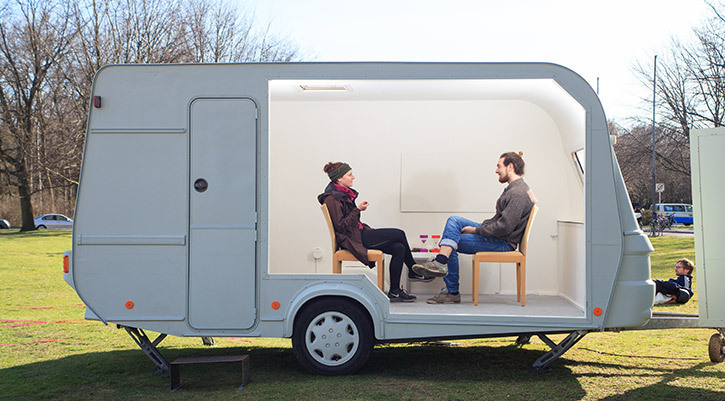 In the LISTENING PROJECT, two strangers conduct an experimental dialogue that focuses on listening to each other. We have had interesting experiences with the project at taz.lab, the topic “Strangers or friends – the pleasure of diversity” has been added. The result of all is a ‘listening dialogue’ between six strangers. PaperSurfing. Talking to each other can make you wiser. Listening to and honestly understanding different perspectives helps to discover errors of thought, expands the view and promotes mutual respect. People are different. Their individual interests cannot be harmoniously dissolved into one another, which is why pluralism, the equal treatment of one another despite great differences, is the most important basis of a free and peaceful society. This is basically a very sober concept, derived from human experience over many centuries. If the rules ensure that everyone has a chance to participate materially and with his or her individual way of life, then things can turn out well. It is therefore a question of cooperation that respects the different interests of all rather than of exclusion. It is therefore the non-delegable task of each individual to talk openly to one another, again and again, with strangers and friends despite and because of all differences. PaperSurfing would like to be a part of it. More about us on artinprogress.info.